Gloss, gloss, gloss… exactly what we wanted! 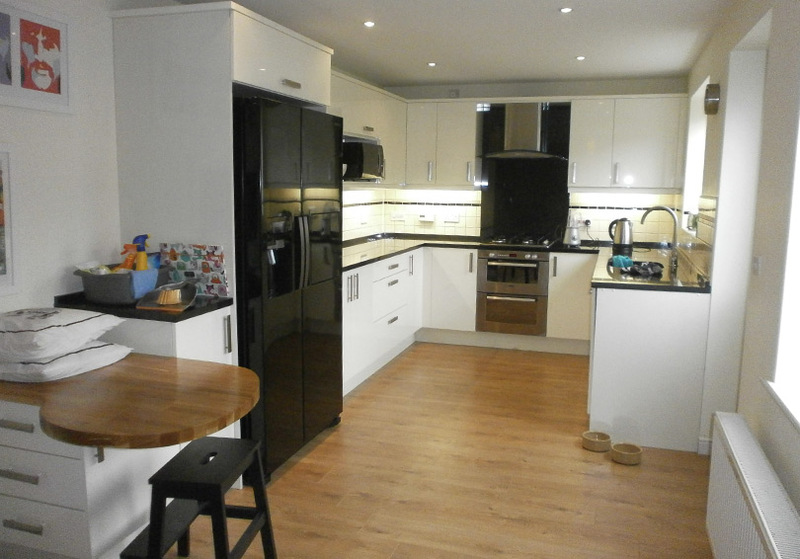 From the minute Andrew and Fiona walked into our showroom they new exactly what they wanted from their new kitchen. They knew the style, layout, appliances and most importantly the price they wanted to pay. It certainly made Emrys’s (our kitchen designer) job much easier! The finished kitchen looks modern and striking in gloss black and white, but with some subtle warmth through the natural flooring and breakfast bar. The designer black Ash Black Granite worktops are highly reflective bouncing the light around the room. Overall it’s a stunning space that’s modern, stylish and practical. Exactly what a kitchen should be. Oh, and have we mentioned the bespoke housing we made for the fantastic high tech fridge freezer! It finishes the look perfectly.